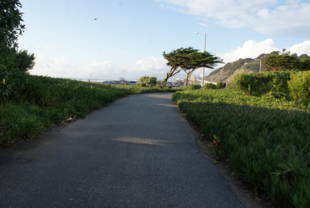 For a beautiful scenic drive or a steady run/walk along the ocean, visit the Great Highway that runs adjacent to Ocean Beach. It's approximately 3.5 miles long, its southern end is at Skyline Blvd and its northern end is at Point Lobos Ave and the "Cliff House." 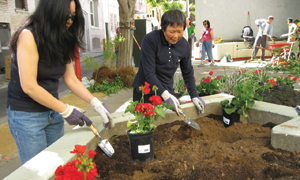 The Great Highway is owned by the San Francisco Recreation and Park Department. The N-Judah and L-Taraval lines both end at or near the Great Highway. 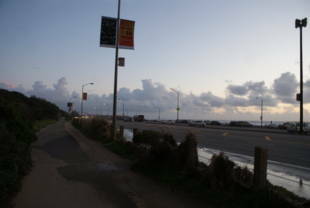 In addition, the 18-46th Avenue bus runs parallel to the beach, but two blocks away. This is a great scenic adventure and is perfect for getting out of your car and walking on the beach. 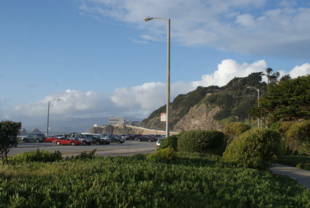 If you're interested in a nice dinner, go to the 'Sutro's at the Cliff House' restaurant at the northern end of Great Highway. 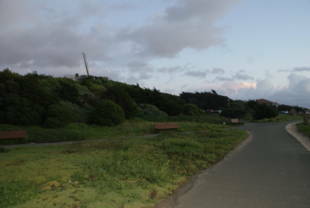 However, what is most special about this area are the remains of the Sutro Bath Houses that were built in the late 19th-century. They burned down in the 1960s and all that remains of the site are a labyrinth of cement skeletal remains, blocked off stairs and passageways, and a dark tunnel with a deep crevice in the middle.